«ناپير مالكلم» در 17 مارس 1870 م (26 اسفند 1248) در «روستاي هندلي» در «استان چيشير» در غرب «انگلستان» به دنيا آمد. او كه كوچكترين پسر «ژنرال سر جرج مالكلم» و برادر «سرهنگ پلوتني مالكلم» -سرپاسبان «چيشير»- بود براي تحصيل به مدرسه علوم ديني «نيو كالج» در «آكسفورد» رفت. پس از اتمام تحصيلات و اخذ مدارك ليسانس و فوق ليسانس، اسقف «منچستر» او را در سال 1894 م (1272 ه.ش) به خدمت در كليساي «شهر اكل» در «استان گريتر منچستر» منصوب كرد. او سپس در كليسا به بخش تبليغ و تبشير رفت. كار او در ايران شايد از سال 1898 م (1276 ه.ش) و در 28 سالگي با اعزامش به عنوان كشيش به يزد آغاز شد. «كشيش ناپير مالكلم» در 24 فوريه 1901 م (5 اسفند 1279 ه.ش) با نامزد خود «دكتر اورانيا لاتهام» احتمالاً در يزد ازدواج كرد. «اورانيا لاتهام» از نخستين زنان پزشك در «انگلستان» بود. آن دو كه همسن نيز بودند در يك گروه به يزد اعزام شده بودند و يكي در كليسا و مدرسه و ديگري در بيمارستان مرسلين در يزد كار مي كرد. «لاتهام» بعد ها «كتاب كودكان ايران» را نوشت و به چاپ رساند. «ناپير مالكلم» پس از 5 سال ترويج آيين مسيحيت و تاسيس و گرداندن كليسا و مدرسه، براي مداواي بيماري اش در سال 1904 م (1282 ه.ش) به «انگلستان» بازگشت و پس از بهبود يافتن، چند ماه بعد دوباره به ايران بازگشت ولي اين بار به «شيراز» اعزام شد. او تجارب، خاطرات و نظرات خود را درباره دوران اقامتش در يزد در «كتاب پنج سال در شهري ايراني» نوشته و در سال 1905 م (1283 ه.ش) در «لندن» به چاپ رسانده است. شايد او در بازگشت چند ماهه اش به وطن و در دوران نقاهتش چاپ اين كتاب را پي ريزي كرده باشد. اين كتاب در همان زمان در «انگليس» و «آمريكا» انتشار يافت و به تازگي دوباره در غرب بازنشر شده است. «كشيش مالكلم» در سال 1908 م (1286 ه.ش) به «انگلستان» بازگشت و پس از كناره گيري و از امور تبليغي و تبشيري، در «برايتون» و سپس در «آلترينچام» كشيش شد. او سرانجام در 19 اكتبر 1921 (27 مهر 1300) در «شهر آلترينچام» در «استان چيشير» در 51 سالگي در اثر بيماري بدرود حيات گفت. 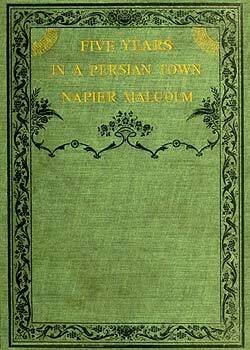 Book «Five years in a Persian town» written by «Napier Malcolm». I feel that this short sketch of a Persian town needs an apology. It will not improbably be mistaken for a book of travel. Stopping five years in on place is not travelling, and the experience of such a stay is not a traveler`s experience. The descriptions that will be found in this volume refers to a very small area, and consequently a good deal of minute work has been attempted that would have been out of place in the painting of a larger sphere. Then, again, this is not a book upon mission work. There is comparatively little about the very interesting work which is being carried on in Yezd by the «Church Missionary Society», but there is a great deal about the circumstances under which missionaries work, for the book is really a description of a Persian town from the missionary point of View. This will explain why certain details, such as the dress and food of the people, are left out altogether; for, although there may be some connection between these things and the kind of way in which missionary work ought to be conducted, it is not at present apparent to the writer. On the other hand, the general effects of house, street, and desert, which meet the Yezdi`s eye at every turn, have been rather elaborately described, for scenery and scenic surroundings have much effect on character, and the study of character is essential in missionary work. In most of the descriptions I have taken special care to preserve the true proportion between good and evil, so far as I have been able to estimate it in the thing described. I have specially done this in the necessarily incomplete sketches which I have drawn of the Yezdi`s character and religious beliefs. But in dealing with the «Persian Government» I have consciously deviated from this practice. Consequently, I must ask the reader to regard all references to the «Government» as going no further than the actual statements. I have also, as far as possible, avoided alluding to political problems; for, in a country like «Persia», for a man engaged in serious missionary work abstention from politics is almost a sine qua non. It will, perhaps, be felt by some that more ought to be made of the points in common between «Islam» and «Christianity». The fact is that when people come to the missionary they do not want to find agreement but disagreement, and consequently the missionary gets to think not so much of what they know as of what they do not know. So a missionary writer is, perhaps, inclined to pass over common points, whatever religion he is writing about. This was drawn when the school was quite small. 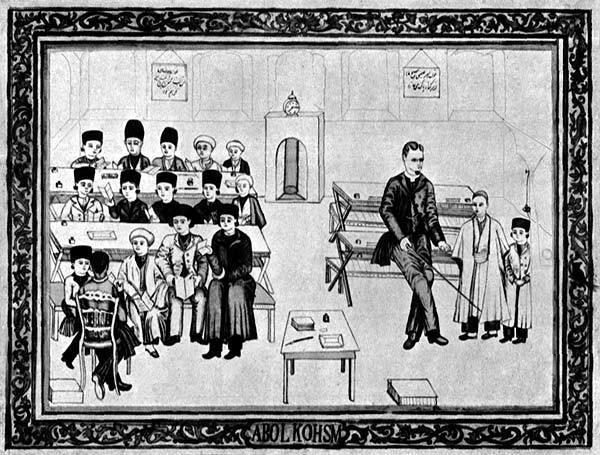 The figure on the left sitting in a chair is «Mesak», my first Armenian schoolmaster. I am on the right leaning against a desk. The thing in my hand is a pointer and not an instrument of punishment. There is a wall in front of me on which was hung the thing to which I was pointing. I should perhaps mention that the square fire-place coming forward into the room is not of a usual shape; fire-places are generally let into the wall. All the boys in this picture are Mussulmans. In the case of «Islam» there are really not many to note, and in support of this statement I may relate a story told by an officer of Indian troops. One day a Mohammedan, in the course of a conversation, said to him: "Of course, Sahib, your religion and ours are very near together. Your «Christ» is one of our prophets." My friend replied: "What do you mean? Of course «Christ» is one of your prophets, but to us He is more than a prophet; He is the Son of God and the pattern of our lives. Besides, there is hardly a single practical point where Mohammedans and Christians are not entirely at issue." The man looked up and said: "Sahib, you have read the «Quran», and you have read your «Bible». I always make that remark to Christians. I made it to a padre the other day; and they almost always say: `Very true; «Mohammedanism» has a great deal in common with «Christianity».` Well, Sahib, when they say that, I know that they have not read the «Quran» and they have not read their «Bibles»." My best thanks are due to «Miss Mary Bird», whose name is well known both in «Persia» and to all interested in that country, for the valuable assistance that she has given me out of the wide and unique experience that she possesses on the subjects handled in my book. I am also very grateful to the «Rev. G. Furness Smith» for several valuable suggestions. I am indebted to the «Rev. C. H. Stileman» and to «Mr. Paul Peter» for some of the photographs illustrating the book. The coloured prints and the picture of the school are from drawings by a native artist, «Mirza Abul Qasim».